Learn about the Iditarod, the northern lights, the Kodiak bear, and more with Larry the pup. While traveling on a cruise to Alaska, Larry the pup and his owner Pete observe the native wildlife and spectacular scenery of the Alaska coast. 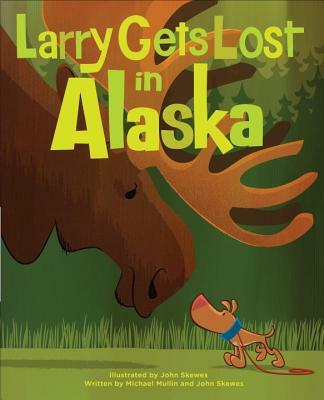 But when Larry finds himself on a sea plane ride after chasing down a tasty treat, the dog and his owner must race across Alaska to find each other. Now in paperback, Alaska visitors and locals can journey into the heart of the Alaskan wilderness with Larry as he encounters bald eagles, fishermen, the North Pole, polar bears, and a team of sled dogs before finally being reunited with Pete. John Skewes is a veteran illustrator and character artist living in Seattle. His clients include Disney, Warner Brothers, Mattel, and Fox. He is the author/illustrator and creator of the Larry Gets Lost series. His other books as an illustrator include Pebbles: Daddy's Girl, Tom and Jerry Adventures, and A Chipmunk Christmas. Michael Mullin lives in LA, but grew up in New England, where all his sports allegiances remain. He is the author of the TaleSpins(TM) books for young adults: The Plight and Plot of Princess Penny and 8: The Previously Untold Story of the Previously Unknown 8th Dwarf. "...the pages are full of cool Alaska facts and funny mishaps shaped into a rhythmic prose kids will love. Larry Gets Lost in Alaska starts on an Alaska Marine Highway ferry and ends in Nome, and rest assured, Larry finds some new friends along the way. Authors John Skewes and Michael Mullin are spot-on with their Alaska trivia, and any family with kids under 10 who is planning on traveling around the state should buy this book before hitting the road, water, or air."